Water is a limited resource, and too much down the drain and on the landscape is wasteful. 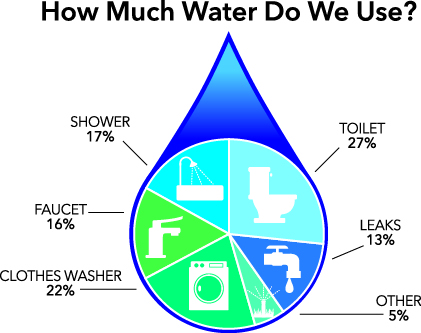 The average American family uses 320 gallons of water around the house each day. As a Shore Steward, there are many ways you can conserve water in your home and yard. This can save you money and help conserve a precious resource. Surface Water: Water on the land surface, such as in creeks, rivers, lakes and wetlands. Ground Water: Water that exists below the ground. Aquifers: A saturated geologic formation that can hold and produce ‘useable’ quantities of water. Ecosystems: a community of living and non-living things that work together. Permeability: the state or quality of a material (soil, rock, silt, clay) that causes it to allow liquids to pass through it. The Water Cycle, A Quick Summary, Howard Perlman, http://water.usgs.gov/edu/watercyclehi.html, U.S. Geological Society, 2014. Salt Water Intrusion Control in Coastal Washington, Department of Ecology Policy and Practice, Emily Tibbott, 72 p, United States Environmental Protection Agency, August 1992. Seawater Intrusion Topic Paper, Doug Kelly, 27 p, Island County Water Resources Advisory Committee, 2005. Water Smart, Not Water Short: 5 Ways to Secure Water for Washington’s Future, 12 p, Washington State Deptartment of Ecology, PUB 09-11-008, 2009. Residential End Uses of Water, 352 p, American Water Works Association Research Foundation, 1999. Saltwater intrusion is the movement of saline (or salty) water into an aquifer that previously held freshwater. If we know the source of the salt water is marine seawater, it is often referred to as seawater intrusion. Seawater intrusion occurs when an aquifer is connected to (outcrops into) a marine water body, and when the pressure in the aquifer falls low enough to allow the movement of saltwater into the aquifer. Areas immediately adjacent to marine shorelines are at the greatest risk for seawater intrusion. Although we cannot generally influence the permeability of an aquifer, we can (and do) influence the recharge area (impermeable surfaces) and pumping rates. Practices such as low impact development that allow water to soak into the ground, and water conservation can both aid in reducing the amount of seawater intrusion. It’s fun and informative to learn where your water comes from. In Port Townsend, most residents know their water is piped from the Big Quilcene River, about 30 miles away! If you don’t already know where your water comes from, call your water provider (the number on the monthly bill) and ask. In Puget Sound, most large cities rely on rain and snowmelt that flows from the mountains into creeks and streams, and from there into major rivers. Seattle, for instance, receives its drinking water from the Cedar and Tolt Rivers, whereas the water source for Everett and some other parts of Snohomish County is the Sultan River, which flows into the Spada Lake Reservoir. Other communities, such as Olympia receives their drinking water from groundwater springs as well as from wells that are supplied by aquifers. If you live in a rural area, you might depend on a well, which may be private, community owned, or part of a public system. The amount of fresh water on earth is only 2.5% and the rest is salt water. While the amount of water on earth does not change much, it does change its form, from vapor to rain, snow, or ice. This continuous movement of water between earth and the atmosphere is called the hydrologic cycle. When precipitation, in the form of rain or snow, reaches land, it percolates down through the soil to recharge our aquifers (underground reservoirs). Some of this precipitation first gathers in the form of ponds, lakes, streams or rivers before soaking into the ground or flowing out into the sea. Much of the water that does not soak in evaporates, condensing in the atmosphere in the form of clouds, then falls to the earth again as precipitation. Plants and trees take up groundwater through their root system, using it to survive and releases it back into the atmosphere, which is referred to as evapotranspiration. Besides providing water to animals, plants, and people, this cycle also helps transport nutrients, sediment, and other substances into and out of aquatic ecosystems. 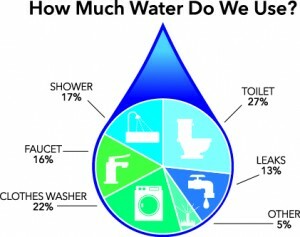 In this country, the in-home use of water averages about 80–100 gallons per day, per person. That’s 29,200 to 36,500 gallons per year, per person. This is for personal use and does not include lawn, garden and other outdoor uses of water. So where does all of this water go? Use a broom rather than a hose or pressure washer to clean walks, patios and driveways. Harvest rainwater for your outdoor watering needs by installing a few rain barrels or other rainwater catchment system. Use commercial car washes where water is reused. Water in early morning or evening and avoid watering when it is windy to decrease water loss from evaporation. Use a soaker hose or drip irrigation system for garden beds because they reduce and regulate the amount of water used. Water less frequently and for a longer duration. Light watering encourages shallow root growth, making plants less drought tolerant. Apply no more than 1/2 inch of water per hour on your lawn. Lawns west of the Cascades only need about one inch of water per week during hot, dry weather depending on type of soil and its absorption rate. Weekly watering should be sufficient for most plants in the ground during the summer. Arrange sprinklers carefully so that they don’t water the street, driveway, or sidewalks and monitor your watering to prevent runoff. Use hoses with a shutoff nozzle and turn off the water when you don’t need it. Place 2–4” inches of mulch around plants and trees to reduce evaporation and minimize watering requirements. However keep mulch from directly contacting stems and trunks to avoid damaging the plants. Retain native plants and soil because the undisturbed soils retain water better and established native plants won’t need to be watered as much as new plants. Use native plants because they typically require less care and water after they are established. TIP: Water conservation is a great way to save money and water. Through your water provider you might be eligible for rebates or discounts on water saving toilets, free leak detection kits, free showerheads, and other incentives. There are many things you can do to conserve water, whether you are on a well or municipal water system. Examine your water bill each month, or if you don’t have one, have a water meter installed and keep track of your water usage. See if you can reduce your use each month for a year. Fix leaky faucets. Even a small drip can easily waste 20 gallons of water each day. Use a high efficiency washing machine and save up to 16 gallons of water per load. Run full loads. Fill your dishwashers and washing machines before you run them. Install a water-efficient showerhead and take shorter showers. Check your toilet for leaks by placing two or three drops of food coloring in the toilet reservoir and checking the bowl (without flushing) for the appearance of color. Fix leaks when you find them. Install low-flow or ultra-low flow toilets saving 13,000 gallons per year for a family of four. Modify older toilets that use more than 1.6 gallons per flush, place a half-gallon plastic bottle filled with pebbles in the toilet tank. Be sure the bottle doesn’t interfere with the flushing mechanism. Don’t use a brick in the tank as it could break down and pieces could get caught in the mechanical parts of the toilet.